…for dealing with phone calls badly. Because some phone calls are tougher than others. Some phone calls loom before you like a wall of fire, and you just can’t get past them. Grandma? Ok, I’ll call Grandma. Routine work matter? Done. Made the call like a champ. Like a boss. Like an emperor! Health insurance issue with numerous complicated variables to go over, but only after you’ve been on hold for thirty minutes and now you have to pee? And the call is probably being recorded? And there’s this weird, sound-obscuring scratchiness on the other end, even though you called a land line? Yeah, I’m a fan of e-mail. 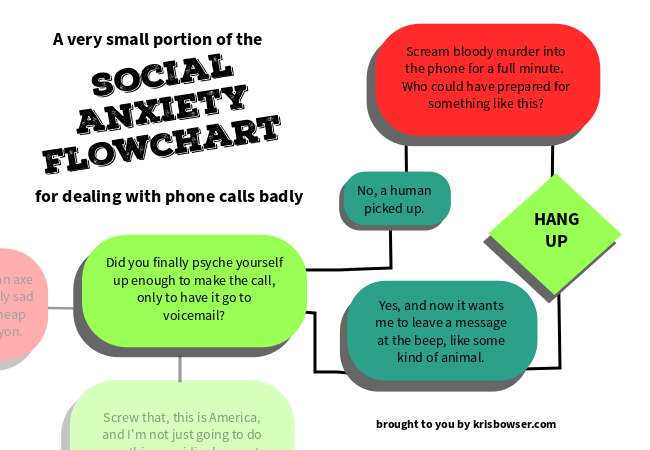 Sometimes, regular old introversion can veer into anxiety territory. Lucky for me, I have a friend who understands this. Together, we came up with a great solution for terrible phone calls. And a great solution deserves a flowchart.